Bleacher Report, the uber-popular sports website is gearing up for one of the biggest global sporting events, the World Cup. To get fans excited for this Summer’s soccer tournament in Russia, they’ve teamed up with artists to paint murals in three cities across the United States. We are so excited to announce that New Orleans has been chosen as one of the mural sites, the painting was completed on Monday, June 4, 2018. How Did New Orleans Get Chosen? With the help of our very own Reed Wiley, the Lafitte Greenway will be the beautiful canvas for this monumental event. As part of an effort by the Friends of the Lafitte Greenway to engage and support the community, this piece of art is going to be a part of one of the most influential developments in New Orleans in quite some time. The redevelopment of the soccer fields in the Lafitte Greenway area pushed B-Mike, the mural’s artist, and New Orleans native, to suggest the Greenway a possible location for the mural. With the help of Bleacher Report, the hope is that this project will be the catalyst in establishing an aesthetic that ties our vibrant culture to the Greenway going forward! You probably already know local artist, Brandan “B-Mike” Odums. 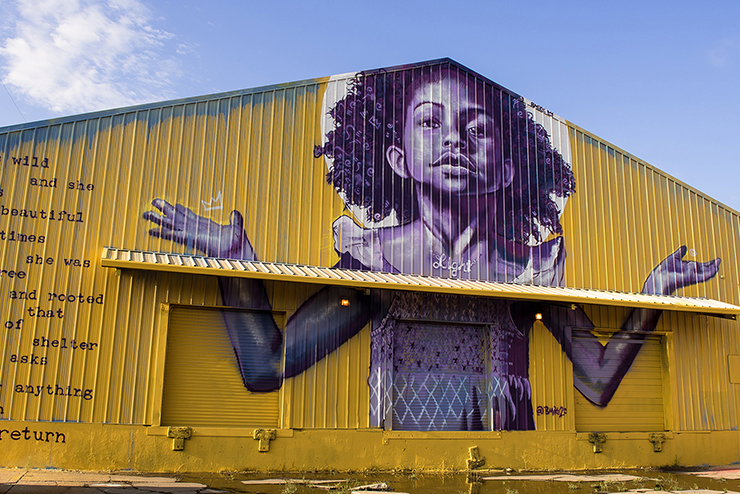 He’s famous for his work on Studio BE, a 35,000 sq ft warehouse in the Bywater. Who Will the Mural Feature? Soccer is far and away the world’s leading sport. Think about this: at the last world cup in Brazil, 3.2 BILLION people watched the exciting matches, and the final alone drew 1 billion viewers. In comparison, the 2018 Super Bowl between the New England Patriots and the Philadelphia Eagles had estimated 103.4 MILLION viewers. So yea, soccer is a big deal around the world. And it’s quickly growing in the U.S. as well. That’s why much thought and deliberation was put into these murals and especially here locally in New Orleans. That’s why organizers decided on Paul Pogba, the French Phenom who dazzles for one of the world’s biggest clubs, Manchester United. He’s a player that demands your attention as he plays with creativity, strength, and flare from his central midfielder position. 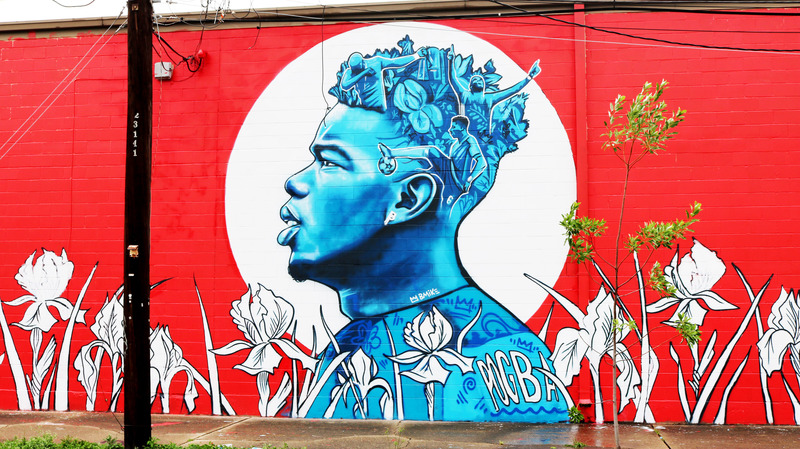 Pogba was chosen to be featured on the Lafitte Greenway mural because of his popularity (a nod to capturing young fans in the area) and for his and the city’s deep French roots. What Other Cities Have Murals? Two other murals have already been painted leading up to the 2018 World Cup (photos below courtesy of Bleacher Report). Pictured left is a Manhattan tribute to Mo Salah, an Egyptian native who stars for the Premier League’s Liverpool FC. Pictured right is the colorful Miami mural dedicated to Brazilian, Neymar, a global phenom who plays for Paris Saint-Germain.